Look for the new Outdoor Access paths in North Ayrshire. Great new paths giving access ot the countryside for locals and visitors alike. Whether you walk, bike, hike or just enjoy the great outdoors, Outdoor Access paths in North Ayrshire are accessible and easily found. Just look for the OANA symbol on the Find-a-Path map. More maops are being added every day. Currently we have paths in Beith, Dalry, Kilbirnie, West Kilbride and Fairlie. Go to the Find a Path page and look for the OANA synbol on the map or choose a path area from the drop-down box. North Ayrshire is a great place to wander about a bit! It may be Winter but you can still get out and about to enjoy the outdoors. From village strolls to low-level country walks, and seaside strolls. Wrap up warm and see the wonders of the countryside on a sunny winter's day. Walking and cycling along the paths, over the hillsides, and through the villages of Ayrshire is the only way to experience the real Ayrshire. 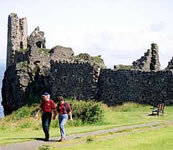 Historic castles and ancient monuments grace many of the routes, some of which are traditional rights-of-way dating back hundreds of years. 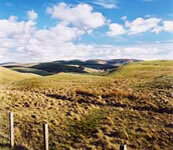 Ayrshire's landscapes range from lush rolling hillsides to white sandy shores, majestic craggy cliffs and caves, medieval forests, dramatic moorlands and small friendly villages. The Ayrshire Paths initiative provides, sensitively managed, well sign-posted routes for all capabilities of walker and cyclist. Routes include Ayr, Irvine, Muirkirk, Maybole, Largs, Dailly, Dalry, Irvine Valley, Girvan, Straiton, Barr, Dalmellington and Cumbrae. There are also great cycle paths. Whether you are visiting Ayrshire or passing through on the National Cycle Route, spend some time experiencing the real Ayrshire.